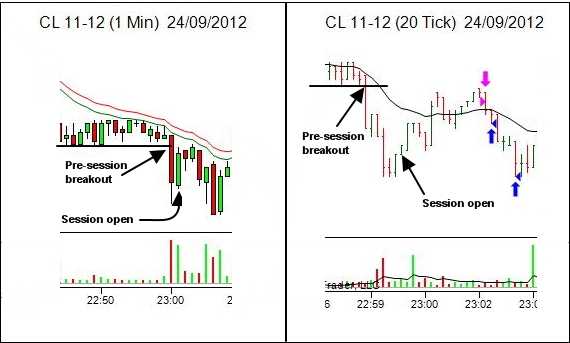 In some sessions, the trade of the day is right there within minutes of the session open. 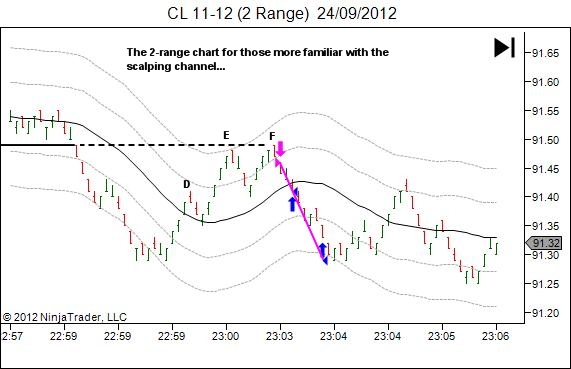 The challenge though, is that in reality your trade setups are never such "picture perfect" events as the above setup appears to be in this article. At the right hand edge of your screen there will almost always be some data which contradicts your bias or at least adds a degree of discomfort. 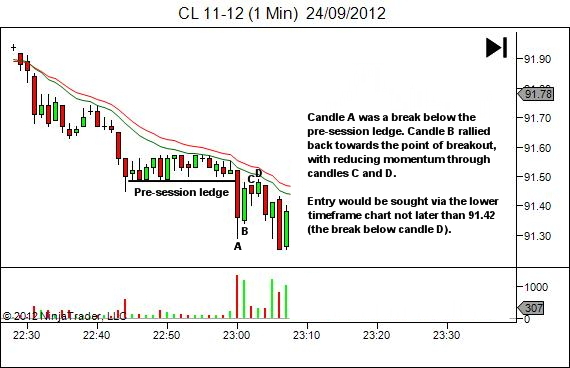 In this case it was the fact that the drop below the pre-session ledge occurred prior to the session open. 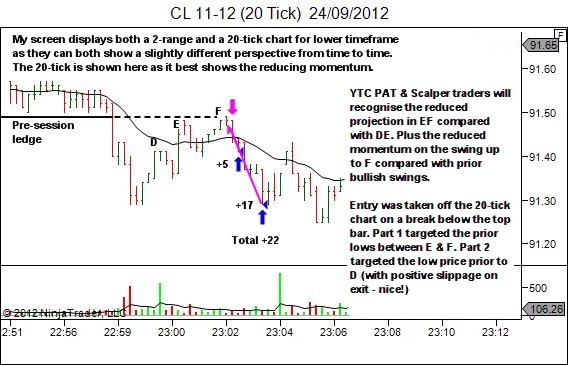 The actual Crude Oil session open was at the point shown on the following diagram, and so the general bias of price movement from session open till the setup entry was in the bullish direction. The trade was fading the direction of early-session price movement. I raise this point because of a comment received via email during this past week, from a reader who finds some contradiction between two statements I've made in the YTC Scalper: "Enjoy the uncertainty" and "Don't trade when you can't see an edge". These aren't contradictory at all. The second statement stands as a RULE. Don't trade when you can't see an edge. A reducing momentum and projection pullback into an area of prior breakout DOES OFFER AN EDGE. It had to be taken. But there will always be uncertainty. In this case the trade is fading the opening move of the session. Now that doesn't mean I don't take the trade; the opening move is reducing in momentum and is taking price right into an area of potential resistance. The market structure says this is a trade. The price action says this is a trade. But it's ALWAYS going to be a little uncomfortable. The statement, "Enjoy the uncertainty", relates to accepting this constant feeling of discomfort. If you have an edge, take the trade. Accept… and enjoy… the uncertainty. Control your risk. And manage whatever the market offers you.